A week from Monday, Vikings players will report to the team’s gleaming new facility in Eagan for the start of offseason workouts, with many players from a team that went 13-3 joining new quarterback Kirk Cousins, defensive tackle Sheldon Richardson and wide receiver Kendal Wright. 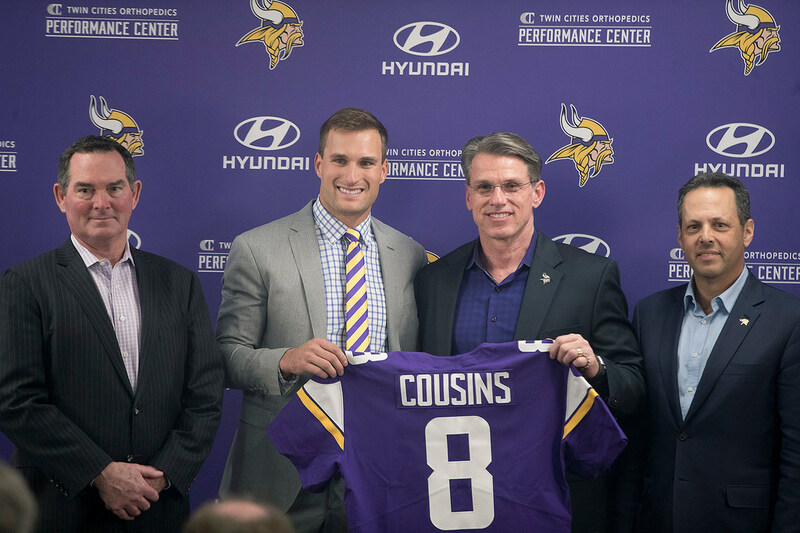 Optimism figures to flow through the team’s new weight room as players use it for the first time, and expectations for the 2018 Vikings will be trebled outside the building. They won’t be alone, however, in thinking they’ve made the moves to get over the top. The Vikings, to be sure, are part of the NFC’s new power class, along with the four other teams (Eagles, Saints, Rams and Panthers) that made the playoffs in 2017 after missing them in 2016. The moves several of those teams made in the offseason, though, coupled with the improvement of a handful of younger clubs and the return of injured star players, figures to make the NFC as competitive as it’s been in some time (at least on paper) in 2018. Our survey of the NFC should start, of course, with the fact the Super Bowl champions figure to see the return of the quarterback that was building a MVP season until he tore his ACL in December. If Carson Wentz is healthy, it’s tough not to put the Eagles at the top of the conference for now. The Eagles added Michael Bennett and Haloti Ngata to what was already the league’s deepest defensive line, and brought in Panthers defensive back Daryl Worley. They’ll have to handle the losses of players like tight end Trey Burton, running back LeGarrette Blount and defensive linemen Vinny Curry and Beau Allen, but Wentz’s return means the Eagles (who will reportedly begin their title defense against the Vikings in September) have to be among the favorites right now. The Rams — who were the No. 3 seed in the conference behind the Eagles and Vikings — have made the most noise this offseason, adding defensive tackle Ndamukong Suh, cornerbacks Marcus Peters, Aqib Talib and Sam Shields, and trading earlier this week for Patriots receiver Brandin Cooks. The Rams traded Robert Quinn to Miami and moved linebacker Alec Ogeltree to the Giants, but a defense with Suh and Aaron Donald in the middle of the line (and Peters, Talib, Shields and Lamarcus Joyner available in the secondary) should do well to complement an offense with even more weapons than it had a year ago. It feels like an all-in move for the Rams, and for whatever questions remain about Jared Goff’s ability to find sustainable success, the Rams should be formidable again. The Panthers added defensive tackle Dontari Poe. The Saints should be strong again. The 49ers — who finished the year on a five-game win streak — signed Richard Sherman and added former Vikings running back Jerick McKinnon. The Cowboys will have a full season of Ezekiel Elliott, the Bears hope to improve thanks to the players they’ve put around quarterback Mitch Trubisky and the Falcons were a play away from facing the Vikings in the NFC title game last year. Oh, and there’s that quarterback in Green Bay who’s returning from injury and who, for all his team’s defensive questions, should make the Packers a factor again. All of this will change, of course, as teams either succeed or fail in their efforts to coalesce and injuries scramble the picture. But we’ve listed 10 teams who either made the playoffs last year or have good reason to think they can improve in 2018, without mentioning the Giants (where Pat Shurmur tries to engineer a quick rebound for a 2016 playoff team), the Redskins (with new QB Alex Smith), the Lions (9-7 a year ago) or Seattle, where a team going through myriad changes still has quarterback Russell Wilson. The Vikings absolutely are among the NFC’s early favorites, and the moves they’ve made suggest both confidence they’re ready to take the final step and an urgency borne of the fact that windows in the NFL don’t last forever. But coach Mike Zimmer said at the NFL owners meetings he intends to greet his returning team this month with a reminder that last season’s success means nothing now. “I’ve been with teams that have been really good and don’t play good, for whatever reasons — everybody’s telling them how great they are,” Zimmer said. “The Philly game might be a perfect example of that. All week long, human nature, everybody’s telling us how great we are. It’s the greatest play ever, and we don’t come off the field for two hours after the game, whatever. And now [Stefon] Diggs is a celebrity. That’s really not who our team is; they’re not a bunch of celebrity kind of guys. But it’s hard to do. I understand how hard it is to [win a Super Bowl] and I think our players understand. Zimmer said he won’t actually play the NFC Championship Game tape on Day 1 of offseason workouts — “I wouldn’t want to watch that, either!” he said — but his point was clear. The Vikings, for all their latent expectations, will have to work to turn them into something meaningful — especially when theirs is hardly the only NFC outpost where optimism courses through the streets.